This is our 2013 Pride edition of Outbeat News In Depth. 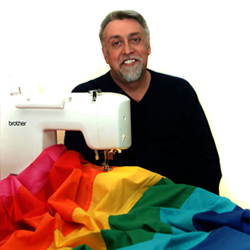 We begin by celebrating the 35th anniversary of the rainbow flag with an interview of the flag’s creator, Gilbert Baker, by long-time LGBT activist Cleve Jones. This interview took place at the GLBT Museum last year. They talked about why the flag was created and how it has become an international icon for gay pride and our fight for equality. The riots that took place at New York’s Stonewall Inn on June 28, 1969 are often referred to as the time and place with gay pride parades began. It was tough time for LGBT people and one of the first events when our community fought back. Roz Katz and Carol Russell were living in New York at the time and had their first date that very night in a bar just across the street from the Stonewall Inn where it all happened. They join us to talk about their memories of that night where it all began. Carol talks about some advice she was given about always carrying three items of typically female clothing in order to prove she wasn’t cross dressing, which was illegal at the time. The only bars gay people could go in hopes of getting served some type of alcoholic drink were those establishments owned and operated by the mafia because it was illegal to serve alcohol to those believed to be homosexual. But something changed that night and Roz and Carol were there to witness history. Both are still together and living here in Sonoma County.